Salisbury, MD – Sherman and the Shorebirds visited McIlvaine Early Childhood Center in Magnolia, Delaware on February 7 as a part of the school’s “I Love to Read” month festivities and to promote the Shorebirds Hit the Books program presented by Dr. James M. Crouse at The Brace Place. The Hit the Books program reaches over 40,000 students from over 100 schools on the Eastern Shore. 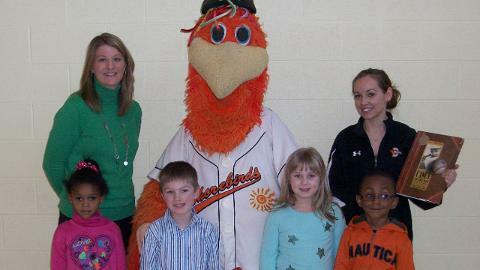 Students that read four books outside of their normal classroom reading receive two free tickets to attend a Shorebirds game. For more information about the Hit the Books program, contact Shawn Schoolcraft at 410-219-3112 ext. 168. This article originally appeared on the official website of the Delmarva Shorebirds. Click here to view the original story. 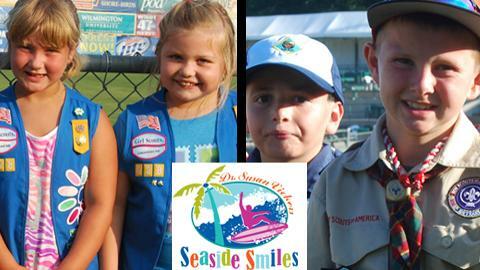 Salisbury, MD – The Delmarva Shorebirds, class “A” affiliate of the Baltimore Orioles, are hosting Scout Night presented by Dr. Susan Vickers at Seaside Smiles on Saturday, April 26. Registration is now open for both Girl Scouts and Boy Scouts. This season, Scout Night will be capped with a fantastic fireworks show after the game. All scouts will also have the opportunity to participate in a pregame parade around the field and enjoy fun and educational activities throughout the game. The cost is $7 per general admission and that includes a participation patch! For more information and to sign your scout group up, contact Eric Sichau at 410-219-3112.